We all remember the Three Musketeers, Athos, Porthos & Aramis (always reminds me of an aftershave that one) and of course everyone?s hero D?Artagnan; well here they are again in this fabulous pantomime. Full of sword fights, wonderful songs and gags this show just races on to its happy conclusion. 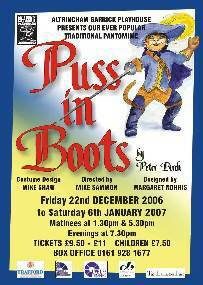 The Musketeers get up to all sorts of tricks in their quest to see right triumph over wrong ably assisted by the amazing Puss in Boots. Expect wonderful costumes, great dance routines and of course loads of audience participation in this truly traditional pantomime. Every year our panto is a sell out so don?t wait to book your tickets and possibly miss out, book now as soon as the Box Office opens; you won?t be disappointed.